Today is due date for my fifth baby! Of course that means my senses and body have been on high alert for the first signs of labor. I have gone overdue with all of my children. My last one was only 2 days late which was pretty much like coming early. The one before that was 12 days late!!! I could have been induced but would much rather have them come when they are good and ready if there are no complications. It sure got old though hearing everyone ask, "Haven't you had that baby yet?" It's an estimated due date people! It's not like the baby has to come on your due date. So if you see a weary pregnant women in the end of her pregnancy don't ask her if she is ready to pop or drop yet...believe me she is! Though I look forward to finally seeing my long awaited baby, I usually dread the labor part. Yes, I don't enjoy pain, but when I have been waiting for almost 42 weeks I'm ready for the pain to begin...bring it on! So how do I get my mind and body ready? Surround yourself with people who encourage and support you in your decision! Now I know this isn't always possible but turn a deaf ear to those who don't understand or try to tell you what they think you should do. There is nothing like the encouragement that comes from someone who tells you," Yes, it's hard...but YOU CAN DO IT!!! I never went to any birthing classes or had a doula but I am sure they would have been helpful so look into your options but remember your body was made to do this... listen to it! Do what feels right! Whether that means moving to a different position, moaning and groaning( yes everyone does it)and breathing. Of course talk to your Doctor or midwife first, but if you have already been exercising you can usually keep it up in a modified form. Since I had already been working out when I found out I was pregnant I was able to keep up my routine, just not at the same intensity. Though of course I have gained weight, it feels good knowing I haven't lost all my muscle that I have worked so hard for not to mention its a great outlet. Join a boot camp or find a friend to keep you accountable, its a lot more fun and easier when you are with other women and have someone to tell you what to do. Along with the benefit of staying in good shape, exercising will help prepare you for the physical demand of labor and give you a head start on getting back into your clothes once you have had your baby! I don't know about you but when I reach the last couple of weeks of my pregnancy I get a little crazy. I have to have everything ready, clean and organized at home or I can not rest. I gain new energy and start to nest like a mad women. I think all the projects that I have been putting off all year get done in those 2 weeks. I do not want to come home with my baby to a big mess, I want to relax and enjoy my baby. Of course the baby wont care what your house looks like but at least you will feel better knowing everything is ready for your new arrival, at least I do. So be prepared! Try to cut back on any extra activities. Get as much rest as you can! Though I admit that is hard for me to do at times when I have so many things going on and little ones to take care of; I can't function if I am overtired. I don't want to go into labor exhausted and stressed. Life is busy and unexpected things happen that you can't foresee but as much as possible give yourself some slack knowing that you have a big job ahead of you and you need to be rested and relaxed. If you are opting for the most natural experience try a water birth! It doesn't take away the pain but it sure helps! After having my first flat on my back, I had a water birth with the last three and much preferred it. Its warm, soothing and easy to move around in. Its also a more natural transition for the baby who has been swimming in fluid during his growth in your womb. Talk to your midwife or doctor about your options. Not only do I pray for physical strength but even more; spiritual and emotional strength. I want Him to strengthen me in my inner being to bring this new life into the world. Know that it is going to be painful and difficult but that it will not be forever. Believe me I pray that it will always be as painless as possible but I know there is going to be pain. I know there are people who say they have had painless natural births; which if so good for them, but I have not experienced this euphoria. This experience of going from such pain to such joy is indescribable! Though I must admit that the painful memories of giving birth have unfortunately not completely left me. But here I am again and I am looking forward to it because the sheer joy of bringing a new life into the world supersedes all the painful memories. 10.) Whatever you ideal birth experience looks like remember that sometimes things don't always go as we plan. Yes, have great expectations but know that you are not a failure if things didn't go as you hoped, it's not your fault. You don't have to compare your birth story with someone else's. Though all of us pray and hope that things will go as smoothly and quickly as possible we are still stuck in sinful bodies in a sinful world that doesn't always cooperate with what we want. The most important thing is that we are healthy and the baby is. This trumps everything else. Every experience is different and special! Embrace this precious gift that God has given us as women! This has been what I have experienced for which I am so grateful but remember that each experience is different and to do what you feel is best for you and your baby! 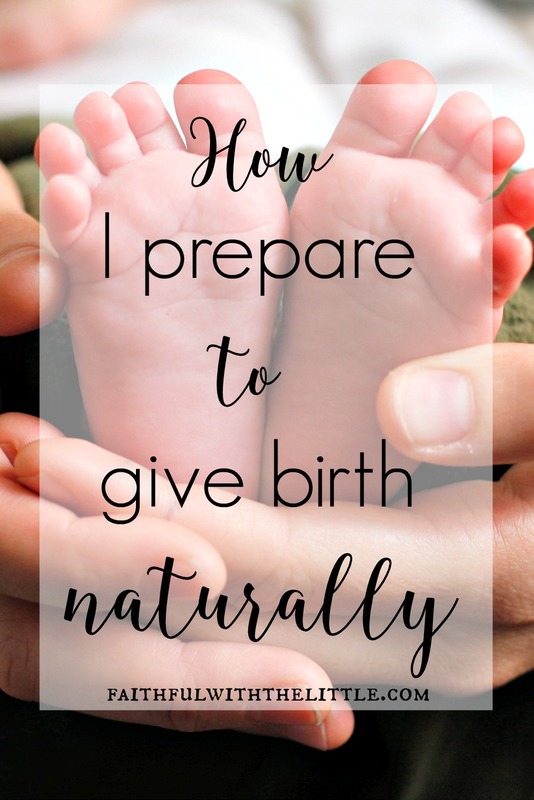 Have you had a natural birth? What would your advice be to giving birth naturally? This is a great list of helpful suggestions. I especially like the idea of focusing on a Bible verse--you suggested some wonderful verses. Might be good for the hubby to memorize the verse, so he can include it in a prayer during labor. Blessing on the birth of this coming baby! Thanks Carol! Good idea about sharing them with my husband! Love the Bible verses. While I did have one, natural homebirth (ended horribly), the rest of my births have been c-sections (3). There are still some great tips for c-section mamas in your list A healthy mama and baby truly is the most important thing! Glad the list was still helpful to you! Yes! So glad that you and your kids are healthy however they came into the world!! Great post Rebekah! I'd love for you to come link it up at the Babies & Beyond Link-Up! what a joy giving birth is! However I am a little chicken...I need my epidural but guess what? with my last baby girl it did not work and I felt everything...it really wasn't THAT bad, I guess the joy of a new baby took care over the pain! I invite you to link up to our blog hop and link party every thursday @ The Family Fun Spot, here is the link if you want to participate http://www.thefamilyfunspot.com/2013/11/bloggers-unidas-2.html Have a great week! I have to say one of the reasons I don't want an epidural is because I can't stand the thought of a needle going into my back!! So I am a chicken also! Thanks for the invite! I look forward to linking up with you!